Recently staff at the Shingwauk Residential Schools Centre (SRSC) began a project to digitize a number of the stock registers, accounts books, and financial records associated with the Shingwauk Indian Residential School, which operated in Sault Ste. Marie, Ontario. The materials in this project ranged in date from 1883 to 1945, with the bulk of the records relating to the 1905 to 1930 period. At first glance these accounts books might not seem like a prime candidate for digitization – visually they aren’t overly interesting and they have been used relatively little by researchers. Digitization takes a lot of time and effort – so why was the SRSC looking to digitize these particular records? One of the major gaps in the SRSC’s archival records about the Shingwauk Residential School, relates to student life from 1905 to 1935. The Centre has a significant number of photographs from 1910-1920 but there is relatively little textual documentation related to this period. The accounts books and associated material are the only written records from this period and can provide insight into the food at Shingwauk, clothing worn by the students, farming practices, and other parts of daily student life. Re-purposed Shingwauk Residential School Clerk’s Fee Book. 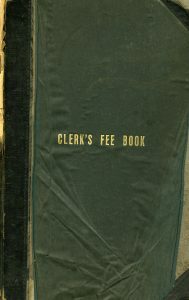 One of the unexpected results of this project was coming across a book that, from the outside, appeared to be a “Clerk’s Fee Book” (pictured above). When Madison Bifano, the SRSC archival assistant, was preparing the book for digitization she realized that this accounts book had been re-purposed as a student register. It contained names of students and information about their weekly attendance at Shingwauk from 1930 to 1941. In some sections the book also divides students into class groupings and lists the teachers for each class, providing additional information about school structure at Shingwauk. The student’s names captured in this book fill a significant gap in the Shingwauk Residential School records and this book is the only record in the SRSC’s holding which explicitly lists Shingwauk students for the 1930s. This book also contains some mysteries which staff are still trying to decipher. For example, the dated columns within the register pages feature a range of notations including: horizontal marks, vertical marks, plus symbols, and the letter ‘s’. There’s no corresponding legend to indicate what these different notations might mean in relation to student attendance. A logical assumption might be that ‘s’ denotes sick, but staff are still looking into possibilities for the other notes. The discovery of this register has triggered a number of conversations within the SRSC office around the reuse of paper, multi-purpose books, and the ethics of finding new archival information. People have been reusing old materials and scrap paper for centuries. This reuse has often been connected to a desire to save on the costs of paper. Example of paper conservation can be seen in the practice of cross-writing or cross-hatching. Crossed letters (example below) are papers that have been written on twice, one in the standard left-to-right manner and a second time with the paper turned 90 degrees and additional writing added on top of the original. 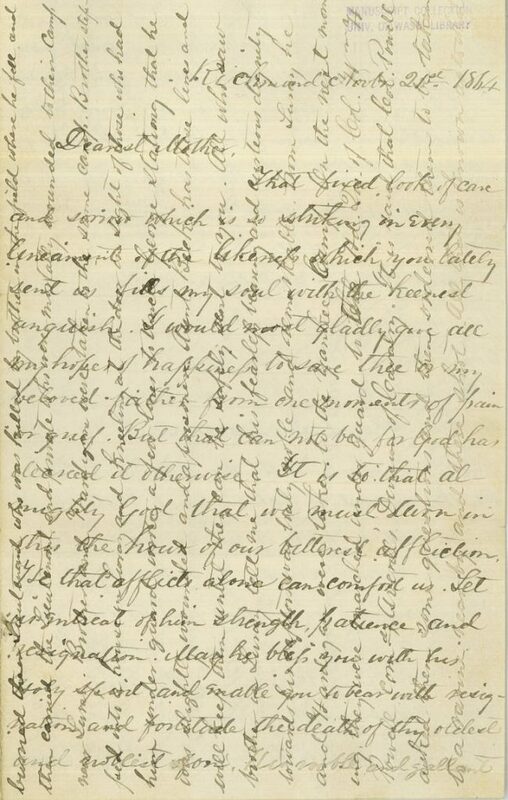 James Crittenden letter to his mother Clara Jones Crittenden, November 21, 1864. University of Washington Libraries, Special Collections. Paper reuse can also be seen in the re-purposing of ledgers and other business documents as personal or community books. For example, Susan B. Anthony repurposed business ledger books to create scrapbooks to document her suffrage work. Likewise, the work of Ellen Gruber Garvey in her book Writing with Scissors: American Scrapbooks from the Civil War to the Harlem Renaissance points to many examples of government issued reports and other publications being re-purposed in the 1800s as family scrapbooks. While working with archival material at Algoma University, I have often found pages of church registers re-purposed to include parish history information and cash books used as minute books for local women’s organizations. The reuse of paper and re-purposing ledgers was a common practice for many years. As archivists and historians what are the ethics about using these unexpected archival finds? What happens when you find personal or confidential material in records which were believed to be relatively impersonal and labelled as unrestricted? In the case of the Shingwauk student register information, this material is old enough that it is in the public domain — however that does not mean that making the content openly accessible is the ethical choice. The SRSC is fortunate to work closely with the Children of Shingwauk Alumni Association (CSAA), a Residential School Survivor organization, who will provide guidance on the appropriate protocols for sharing this information. This register information will be made accessible to Survivors and intergenerational survivors of Shingwauk, and a decision will be made about making this information accessible to the broader public. For individual scholars the ethics around access and use of unexpected personally identifying archival material may be less clear. What should a historian do if they come across a set of records that should have been restricted, destroyed, or redacted? Do you tell the archival staff, even if that means you might not be able to use the material for a research project? I don’t have the answers, but I do think these are conversations that archivists and historians need to be having. Krista McCracken (They/Them) lives and works on Robinson-Huron treaty territory, in the traditional homeland of the Anishinaabe and Métis. Krista is a Researcher/Curator at the Shingwauk Residential Schools Centre and an editor of Activehistory.ca.